Taylor Hosford from Madison, Florida decided to travel up to the Carolina's this summer with her family and tackle the Southeast Super Truck Series. They teamed up with Mike Green & Kenny Campbell Motorsports. The MG & KC Motorsports team has proven over the last few years to be a serious threat at the tracks no matter who the driver was. With the addition of Taylor to the team they were going to compete for the Rookie Of The Year and the 2018 SEST Series Championship. 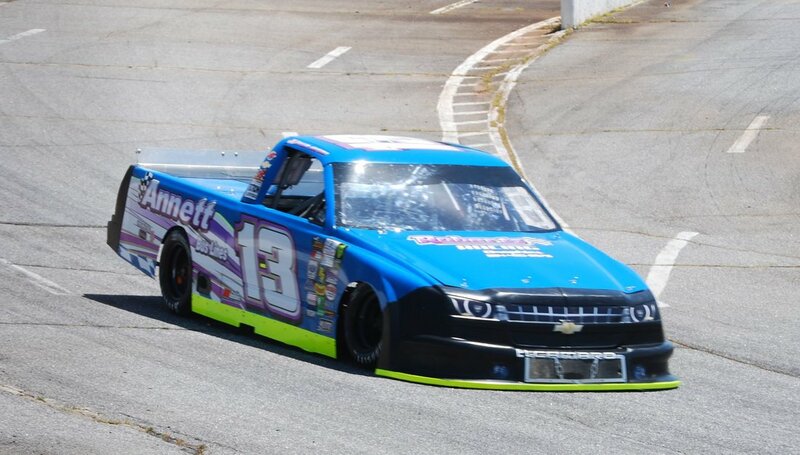 She will be piloting the #13 Annett Bus Lines Chevrolet El Camaro. The first race of the year, the SEST Series headed to Anderson Motor Speedway. Miss Hosford was super quick all day, but she had trouble in qualifying and decided to make changes to the truck afterwards. Resulting in her starting dead last for the feature. She proved to the series and the fans that she was going to be a threat to reckon with this season. With just 20 laps in the race she had worked her way inside the top five. However the first race of the season it just wasn't meant to be. Mechanical failure finished her off, however she finished 10th (Her worst finish out of four races so far this season). The team regrouped over the off weekend and headed to Tri-County Motor Speedway. Taylor quickly adapted to the multi-groove 4/10ths mile facility and ran some impressive laps in practice. She battled with two time series champion Kenneth Headen during the race, lap after lap. Showing she wasn't afraid of anyone, with just a handful of laps left in the race she managed to over power Headen and finish the race in second in her second start. Going from this momentum, The Hosford's and MG & KC Motorsports team carried their progress into the next race. Hosford returned back to AMS for the third race of the season. She picked up where she left off from the first race of the season. Taylor was extremely fast again in practice and qualifying. She battled hard during the race with several past champions of the series. Raced side by side with several drivers and dodged the big wrecks. Coming home with another top five finish, finishing fourth. So now with just three races in the books, she has three top 10's, two top 5 finishes. After several weeks of getting rained out, and the series re-scheduling, the team was finally able to hit the track for the fourth race of the 2018 season. Once again she proved to the other teams she was there for one reason and that is to win. Running super fast and consistent lap times all day during practice. She qualified on the outside pole, giving her a front row to start the race. During the race, she fought off several charges from different drivers and saved her tires for the end of the race. " I knew we had to fight to stay up front. The guys usually come on strong in the beginning but fall off a little later in the race, while I just run the same pace. I knew if we stayed up front we could be a threat for the win with about 10 to go" stated Taylor. And that is exactly what she done. With just a handful of laps left in the race she caught the second place truck of Headen and passed him setting her sights on the leader (Tyler Worley). As they took the white flag, she was right in the tracks of the leader sailing off into turn three. "The win was running through my mind! I had one lap to catch the leader! I knew I could probably get to him but I didn't know if I could complete the pass in time" Taylor said. However right in front of the field a couple trucks wrecked and Taylor seen a hole on the bottom of the track and went for it. The leader went high, as they got closer to the wrecked trucks the leader changed lines and crossed Taylor. Resulting in Taylor hitting the leader directly in the door. "I was right there on him coming out of two but I looked ahead and saw the two trucks at the top of 3 and 4. (I think i saw them before my spotter did.) I knew the bottom had a clear path which was good because that was where I ran all night. I saw him pick the higher line going into 3 and I wasnt sure how that was going to work out for any of us. But I wasnt lifting, I mean this was for the win! Then about half way through the corner I saw him coming down to miss the other two trucks, me & Worley got together and I t-boned him. I couldn't believe after that good of a run we weren't going to finish the race, until I realized no one passed us and everyone else was in the wreck too. We came out finishing second again!" said Taylor. Three Top five finishes in four races, and the worst finish of the year being 10th. This woman is on her way to prove a point this year. She is only 10 points out of the lead in the Championship hunt and currently leading the Rookie points. Her next race will be June 30 at Anderson Motor Speedway. You can follow along with her on her Facebook page Taylor Hosford Racing #13 for all the latest updates. Come cheer her on as she will be gunning for her first win of the season.